Obtaining a test certificate from government authorized laboratory is one of the requirements to import goods containing hazardous waste materials. What are the procedures to obtain test certificate from laboratory? 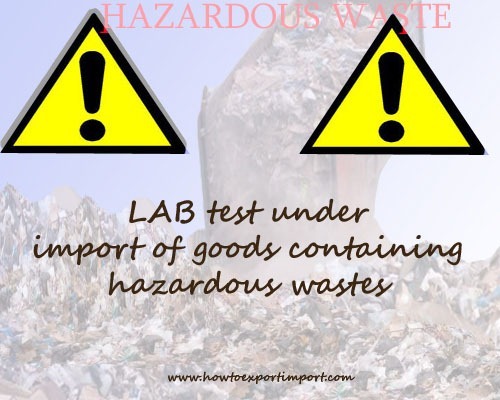 For any import of goods containing hazardous wastes, the importer has to obtain a test reported from authorized government registered laboratory. A sample of such goods is drawn and arranges a detailed testing to find out the contents of hazardous wastes. 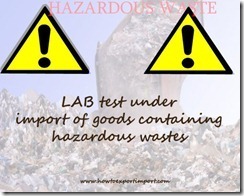 In most countries, the laboratory to test hazardous waste is notified by the environment department of country. Test report retains for minimum two years to confirm on obligation fulfillment by importer on importation of hazardous materials. Such certificate is submitted with customs location of importing country to process importation of hazardous wastes. If non fulfillment of obligation by importation of hazardous waste articles, the importer should re-export the hazardous waste within 90 days from the date of arrival in to importing country as per hazardous waste management, handling and trans boundary rules. I hope, the above information about laboratory certification for import of goods containing hazardous waste material provides you basic information, as a part of import procedures of materials containing hazardous waste. If you would like to add more information about test certificate to import hazardous wastes, you may opine below. Share below your views about laboratory testing certificate under import of materials containing hazardous wastes.